Born in Cali, Colombia. Jimmy Tanaka gave his first piano recital at the age of four. He went on to study at the Paris conservatory and the Bogota conservatory under the supervision of his mother Inés Nava, pianist herself and while in his teens, performed as a concert-pianist several times with the Colombia Symphony Orchestra and the Philrmonic Ordhestra of Cali. In Canada since 1968, he won the Senior Piano Award at the Saint John, New Brunswick Music Festival. Following two years of studies at Vincent d'Indy school of music, he began electric bass and percussion studies. Jimmy rapidly became part of the Quebec and Canada musical milieu acquiring a brilliant reputation through his constant collaboration as a pianist, percussionist and/or arranger with well known artists : Véronique Samson, Robert Charlebois, Diane Dufresne, André Gagnon, Wilson Pickett, Nanette Workman, Mireille Mathieu, Lewis Furey, Patsy Gallant and many others. Original music for documentaries and theater plays has been his major field of musical productions for the last 15 years. Internationally acclaimed theater directors like René Busch and Jorge Alí Triana have collaborated with Jimmy for plays like La fiesta del Chivo, Don Quijote. La vida es sueño and Doña Flor y sus dos maridos. Jimmy also wrote original music for the play “Bug” by Tracy Letts which was presented in NY and Puerto-Rico, produced by Boundless Theatre Company. Along with other musical activities, he assumed the musical direction for Diane Dufresne, Robert Charlebois, Luc Plamondon’s Starmania, Anna Prucnal, Nancy Martínez and Nanette Workman as well as the production of the album “Chanteur de Pomme” by Raôul Duguay and “De l’autre côté de la pluie” by Gilles Rivard. He composed original pieces and produced several albums for saxophonist Justo Almario in Los Angeles, including “Plumbline”, a 1987 “Dove Award” nominee for best instrumental album of the year in Nashville, Tennessee. 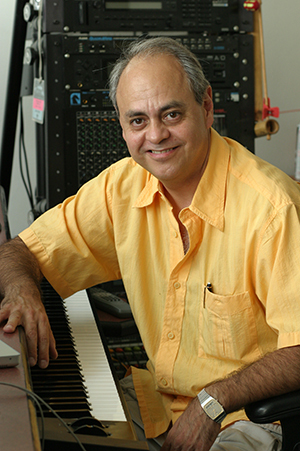 Nominee for the Gémeau Awards in different categories and winner of the "Félix" award for best record producer of the year in 1983 ("De l'Autre Coté de la Pluie", Gilles Rivard), Jimmy teamed up with Osvaldo Montes in the production and musical direction of several feature films’ sound- tracks : "La Guêpe" by Gilles Carle, "A Corps Perdu" by Léa Pool, "Fierro, l'Été des Secrets" by Roch Demers, "Rafales" by André Melançon, and François Labonté’s "Bombardier" and “Alys” TV mini-series. During the summer 2000 “Canada Festivities”, he was the musical director for the circus “Çé la Fête” and in the last few years Jimmy diversified once again his career by programming the orchestral sequences for the Québec produced shows “Cinémashow”,“Génération Motown” and “Dalida, une vie” as well as creating and producing original music for Télé-Québec TV station’s productions, as well as award winning documentary films produced by the “National Film Board of Canada” and Argus Films in Montreal.